Pennsylvania gained three seats in reapportionment following the 1820 United States Census. 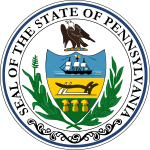 Pennsylvania elected its members October 8, 1822. Pennsylvania 1 None (District created) New seat. Redistricted from the 1st district Federalist 1822 (Special) Incumbent lost re-election. Redistricted from the 3rd district Federalist 1820 Incumbent re-elected. Redistricted from the 1st district Federalist 1818 Incumbent re-elected. Pennsylvania 5 None (District created) New seat. Redistricted from the 3rd district Federalist 1820 Incumbent lost re-election. Plural district with 2 seats Ludwig Worman Federalist 1820 Incumbent lost re-election. Incumbent then died October 17, 1822 and winner was also elected December 10, 1822 to begin term early. Redistricted from the 6th district Democratic-Republican 1822 (Special) Incumbent re-elected. Redistricted from the 6th district Democratic-Republican 1818 (Special) Incumbent re-elected. Plural district with 3 seats None (District created) New seat. Redistricted from the 4th district Democratic-Republican 1820 Incumbent re-elected. Redistricted from the 5th district Democratic-Republican 1821 (Special) Incumbent re-elected. Redistricted from the 5th district Democratic-Republican 1820 Incumbent lost re-election. Redistricted from the 9th district Democratic-Republican 1820 Incumbent re-elected. Redistricted from the 8th district Democratic-Republican 1820 Incumbent re-elected. Redistricted from the 13th district Democratic-Republican 1820 Incumbent re-elected. Redistricted from the 12th district Democratic-Republican 1816 Incumbent re-elected. Redistricted from the 14th district Democratic-Republican 1822 (Special) New seat. Redistricted from the 11th district Democratic-Republican 1820 Incumbent re-elected. Redistricted from the 15th district Democratic-Republican 1820 Incumbent re-elected. ^ a b Changed parties. ^ Cox, Harold (January 14, 2007). "Pennsylvania Election Statistics: 1682-2006" (PDF). The Wilkes University Election Statistics Project. Wilkes University. Retrieved February 24, 2019.